This is another installment of the Gazette’s Officer Interviews. This installment introduces the current Kingdom Equestrian Officer, THL Aaliz de Gant who answered the following questions regarding her involvement in the SCA, the equestrian program and her thoughts on equestrian activities in the Kingdom. 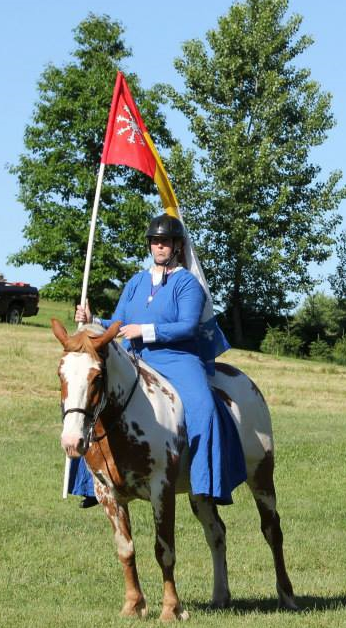 My first event was Pennsic 29. I started getting more involved in a local group after Pennsic 30 though. The people – I have friends that became family. I can’t imagine life without them. How did you become interested in equestrian activities and become the Equestrian Officer? I’d been part of a couple households that were pretty much fighting households. When they fell apart as households sometimes do, I found myself at loose ends right around the time a demo came up for equestrian activities. 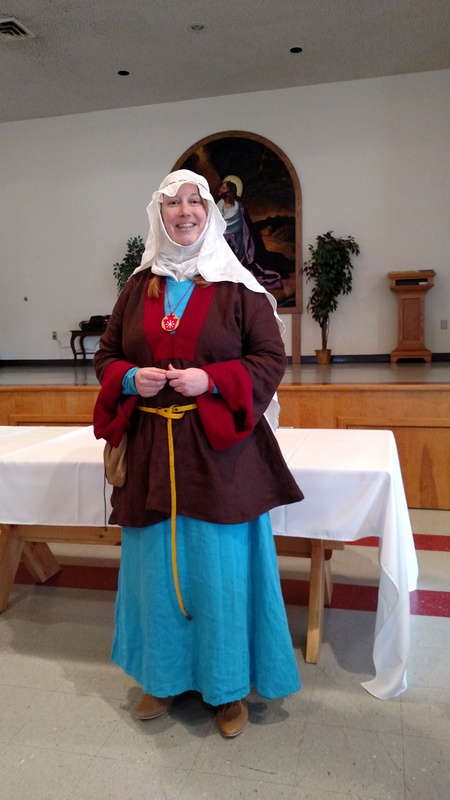 I authorized at that event and was thrilled to be able to combine my SCA life and my horses. It is not every day I can manage to combine my expensive and all consuming hobbies. What is the role of the Kingdom Officer for Equestrian? Bringing policy from the Society Equestrian Officer to the Kingdom, setting and ensuring rules and policies are being followed within the kingdom, encouraging involvement, refereeing squabbles should they arise, warranting marshals, conducting marshal training, and generally being involved and attending events. Do you have a general philosophy about your job? I think that I should be able to prepare people to get involved in equestrian events if they express interest. I think the people within the program should “own” their program. How would someone get involved in equestrian activities? Talk to me or to any of the equestrians and we would be more than happy to discuss how to get you involved. If you don’t have a horse and simply want to be around them, we always need ground crew at events. If you have horses, we’d love to have you involved. If you want to start something in your area, talk to us and we’ll try to see what we can do. What is an example of something you think the general populace should know about horses, but don’t? This is harder — I’ve had horses my whole life so I’m never quite sure what people do and don’t know. But I think one of the hardest things to understand about equestrian is that there are two of us that have to work together – the rider and the horse. If either of us is having a bad day, it’s going to be a lot more obvious than in other disciplines. The best rider in the field isn’t always the one that will come out on top because horses have a mind of their own. You can practice hard, then have your horse decide on that day that it’s afraid of equipment that he/she has seen a thousand times. But the more practiced a horse/rider combo are the more they understand each other and the less you’ll see cues going on, in general. When both horse and rider work together it makes it look like what they are doing is effortless. Where do you see the Equestrian program going in the SCA or the kingdom – Are there any changes coming? Society wise, there is a lot of encouragement and interest for more jousting. We have a couple of people in Æthelmearc who are very interested in jousting and they are working towards getting more of it in our Kingdom. 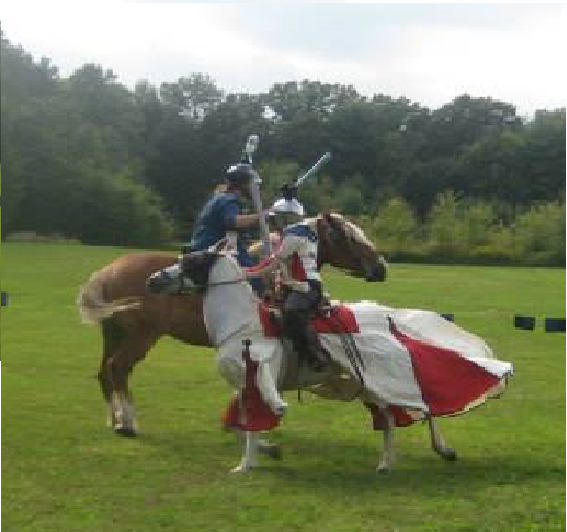 What is the best part about equestrian activities in the SCA? A sword in one hand and reins in the other and people that think it’s just as incredible as you do. THL Aaliz fighting Mistress Arabella on horseback.